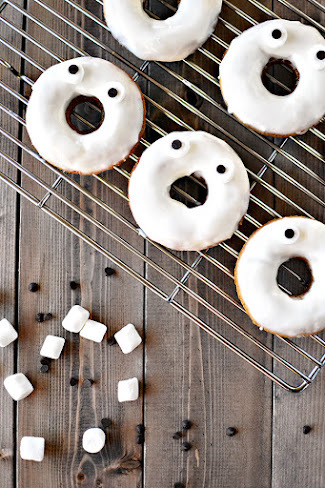 How ridiculous looking are these little ghosty doughnuts? When coming up with the idea, I pictured them much scarier but they kind of look like I scared them! 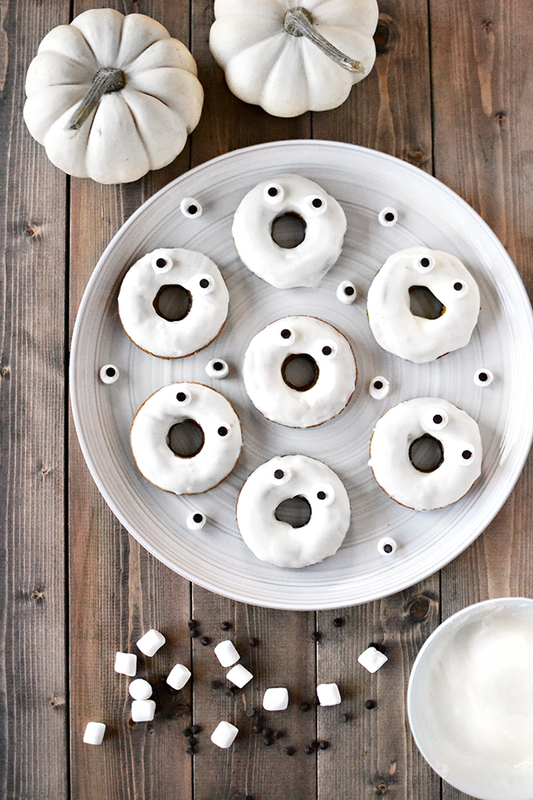 The pumpkin spice doughnut recipe comes from my all-time favourite gluten-free doughnut book, Baked Doughnuts for Everyone. I was eagerly awaiting the right time to try this recipe and with Halloween just days away and the excuses to make pumpkin-flavoured anything running out, I knew I had to get these up asap. I think these would be really great for a kid's Halloween party, or heck, an adult one too! And if you want to make things really easy, just buy a dozen doughnuts and all you have to do is glaze and goggly-eye them. Done and done! What Halloween treats are you making this year? 1. Preheat oven to 350ºF (180ºC) and grease the doughnuts pan well. 2. Combine all the dry ingredients (first 11 ingredients) in a large mixing bowl. 3. In a separate bowl, whisk the eggs together. Add the remaining wet ingredients (last 5 ingredients). Whisk well until combined. 4. Pour the wet mixture into the dry mixture and stir with a wooden spoon until just combined. Make sure to not over mix. 5. 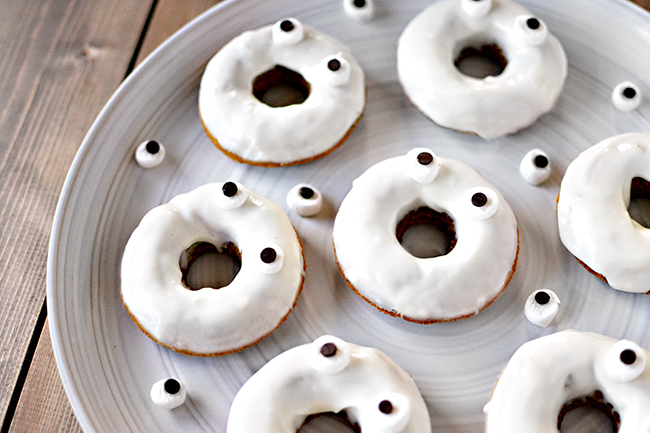 Spoon the batter into each doughnut mold, leaving 1/8-1/4" at the top. 6. Bake for 18-22 minutes, until lightly golden and an inserted toothpick comes out clean. 7. Let cool in pan for 5-10 minutes. 8. Carefully remove the doughnuts (mine were a little stuck so I ran a knife along the edges). Let them completely cool on a baking rack. 1. 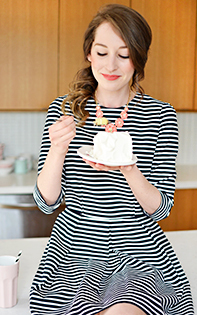 In an electric mixer, beat the cream cheese until smooth. 2. Add the vanilla and milk and beat again. 3. Slowly add the icing sugar and beat until combined. If glaze is too runny, continue to add icing sugar by the 1/4 cup. 1. 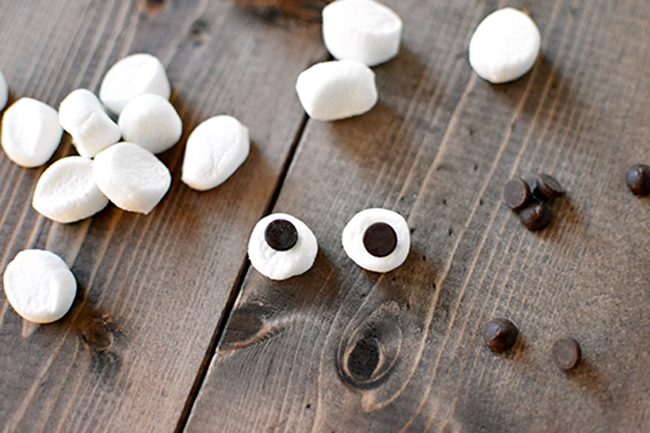 Cut mini marshmallows in half and insert a chocolate chip, pointed side inwards, into the non-cut side of each marshmallow (the sticky side will help to adhere to the glaze). 2. Dip the doughnuts in the glaze and set them on a rack to let the excess glaze drip down. 3. 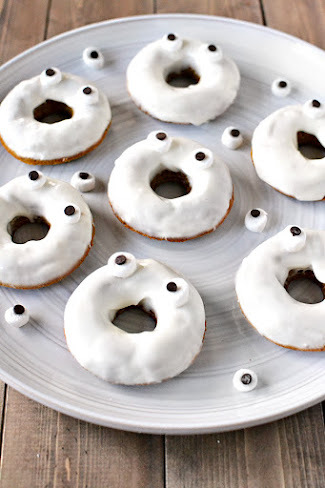 Place marshmallow eyes onto each doughnut while the glaze is still wet.